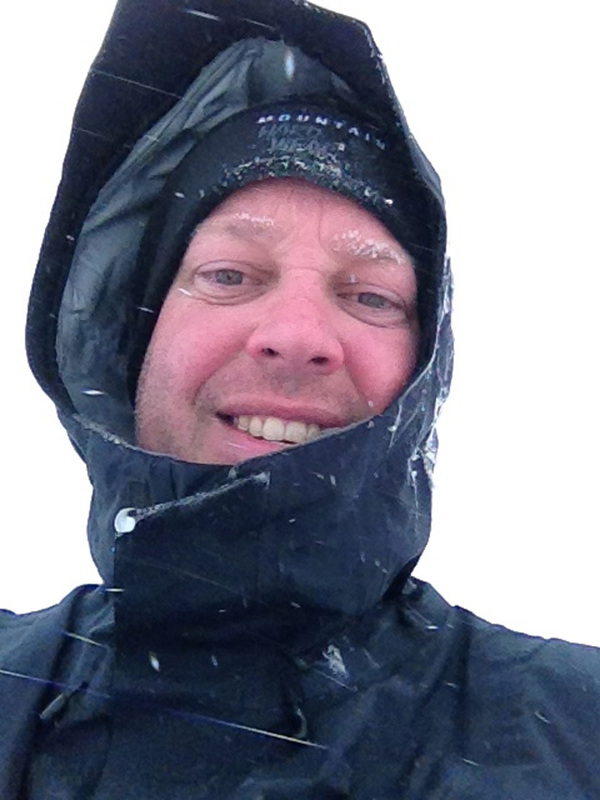 On April 13, 2013 I had an opportunity to make a go at the summit of Mount St. Helens standing at 8365′ above sea level. What a treat! I was visiting Olympia, WA for work and had only prepared for a 10 mile hike in the low areas after having called the Mount St. Helens Institute and found that April wasn’t typically the best time for climbing the mountain. I left my name and number with Lonefir just in case. This is the place you get your climbing permits to ascend above 4800′ on the mountain/volcano. How my luck changed! 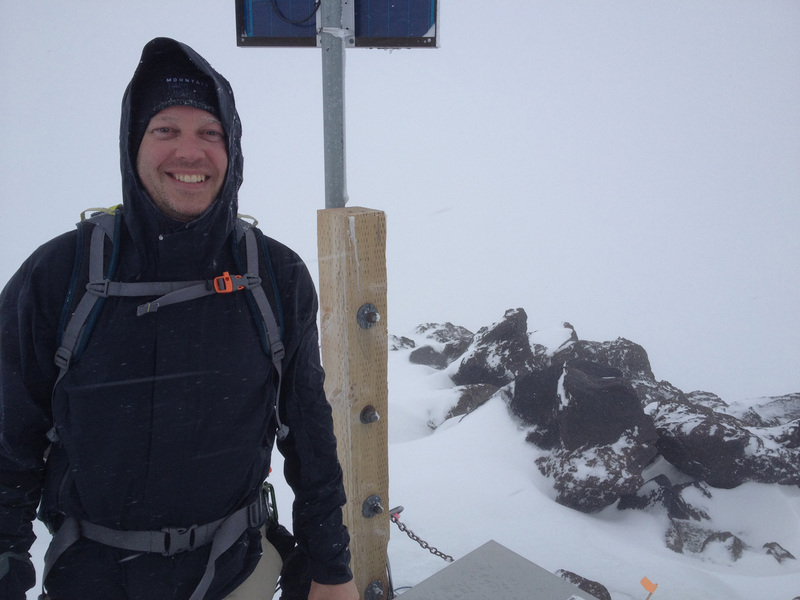 During the week in Olympia on Tuesday April 9 I got a text from Jared, a member of the Volcano Rescue Team who said he would take me up the mountain if his mock rescue was cancelled. He texted me late Thursday April 11 to let me know the mock rescue was definitely cancelled. Here we go! The race was on for me. Friday night I ran to 2 different REI’s to pickup the OR waterproof mittens, OR gaiters and the Smartwool mid weight leggings I would need for the trek. I needed these items for Mt. Kilimanjaro anyway. Here is my full gear list for Mount St. Helens. As you read this, there are some decided differences in the guide’s notes on our elevation and my iPhone 4S GPS altitude tags in the EXIF JPG data. The guide said the parking lot was 2000′ but a quick look at a topography map shows it was 2650′ at the parking lot, so… ya, maybe he was just wrong? I didn’t take a photo with my iPhone at the parking lot so I don’t have a frame of reference for my other photos vs. what the guide said although he was already off by 650′ at the start. It was a great hike either way and the weather really did turn us around as the videos will show. So, we drove into the Mount St. Helens National Volcanic Monument and parked the cars at 2650′ in the parking lot marked by map pin #1 (see map below) at Marble Mountain Sno-Park. There was a gentle breeze and very light snow. This would be my first trek in snow shoes. You’ll see those in a video later. We started off on our trek around 8AM. Although I stumbled a couple times getting used to the snow shoes, I managed to not fall because of them. They certainly gave my leg stabilizers a wake up call! After about 2 miles or so we poked out of the trees and hit the 4800′ elevation sign marked by map pin #2 (see map below). Actual elevation here is about 3930′ warning you of the impending limits ahead if you don’t have a permit. The wind was blowing a little and the snowfall was steady. You can see visibility is not so great below. Mount St. Helens at 3930′. The tree line ends in the background and we followed the ridge directly in line with my head towards the top. We made our way up to the last trees in the photo above and stopped for a snack, more water and to put our shells on. By now we can feel the wind a good bit and visibility was getting worse. The end of the tree line is map pin #3 (see map below) where the next photos were taken. My guide, Jared, with the Mount St. Helens Institute and a Volcano Rescue Team member. Mount St. Helens at 4236′ as we view off to the right from the last tress before the steep ascent begins. As we step out above the trees and up the steep ridge, the trek is tough but I’m feeling great. There isn’t really a fight with altitude here and my legs are nice and warm. The steep part is a new challenge. At times we are at 30-35 degrees incline going straight up, snow shoes digging into the frozen hard pack. Of course, blown in-between the hard packed areas are soft fluffy piles of powder making uphill movement a drag! I learned to use the rest step, with a straightened rear leg and a brief pause before taking the next step. It worked fairly well. It also helped ease some of the backwards slipping on the steep slope. I wasn’t really out of breath, or even breathing hard at all during this part and we were making great steady progress. The weather was becoming a clear issue, so the decision was to make it to the GPS station at 6000′ and assess our status at map pin #4 (see map below). My camera’s GPS Altitude tag says 5561′ at this location but the weather was wicked so it may have affected accuracy. Below the photo is a video so you can see what the weather was really like! Mount St. Helens at the 5561′ GPS station. Check out the video link to see what it was really like! 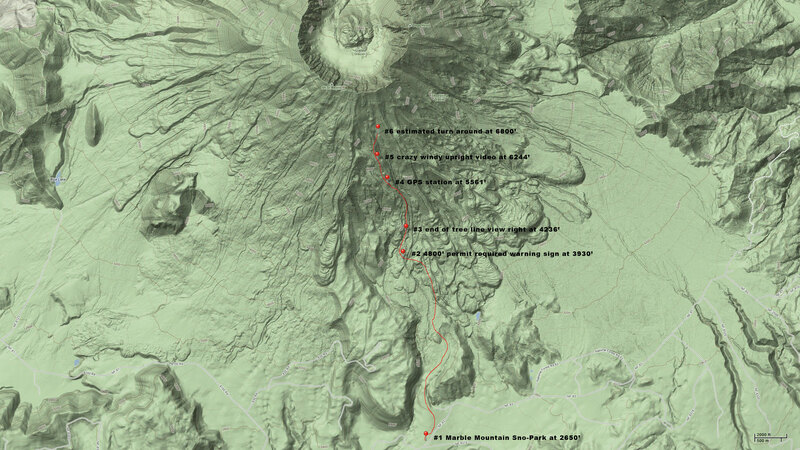 Video from Mount St. Helens 5561′ GPS point. At this point we decided to go a bit further up the mountain. As Jared is a member of the Volcano Rescue Team, he thought to take the orange flags up and mark our path in case there were other climbers behind us. But seriously, pretty much everyone else had already turned around. And, he couldn’t get the bamboo sticks to push through the hard pack, so we couldn’t set any flags anyway. Still, we continued forward. At about 6800′ (camera GPS says 6244′) we stopped to re-asses the weather. The picture at map pin #5 (see map below) shows snow flakes screaming sideways, but the video shows how it really was. Mount St. Helens at 6244′ before we turned around due to bad weather conditions. The guide says we are at 6800′ in the video. Conditions were white out, so it was hard to tell. How bad was the weather? Check out the video linked below! Video from Mount St. Helens at 6244′ just before turning around. Jared and I went up to about 6800′ at map pin #6 (see map below) and we called it due to weather. 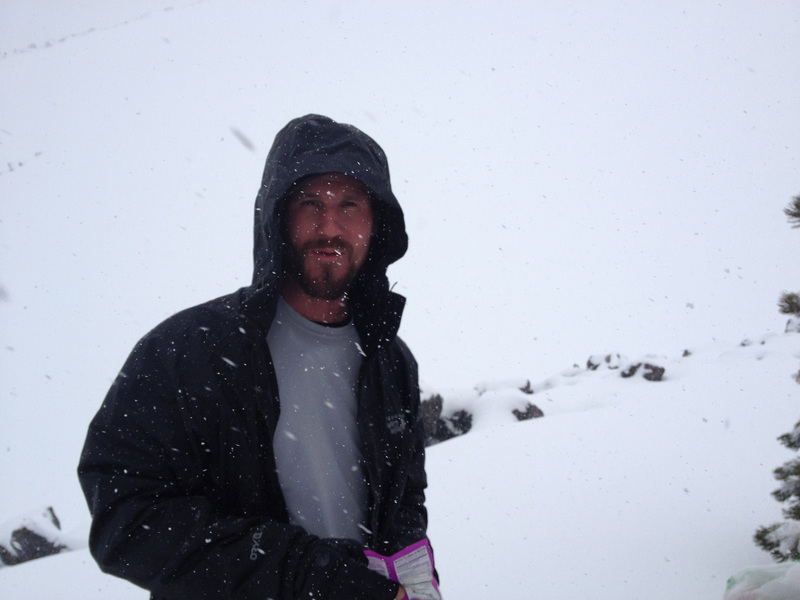 I had way more than enough in me to make it to the summit, which means my training is going great, but safety first. We were in near hurricane force winds and virtual white out conditions. Even if we made it to the top, we wouldn’t be able to see anything. 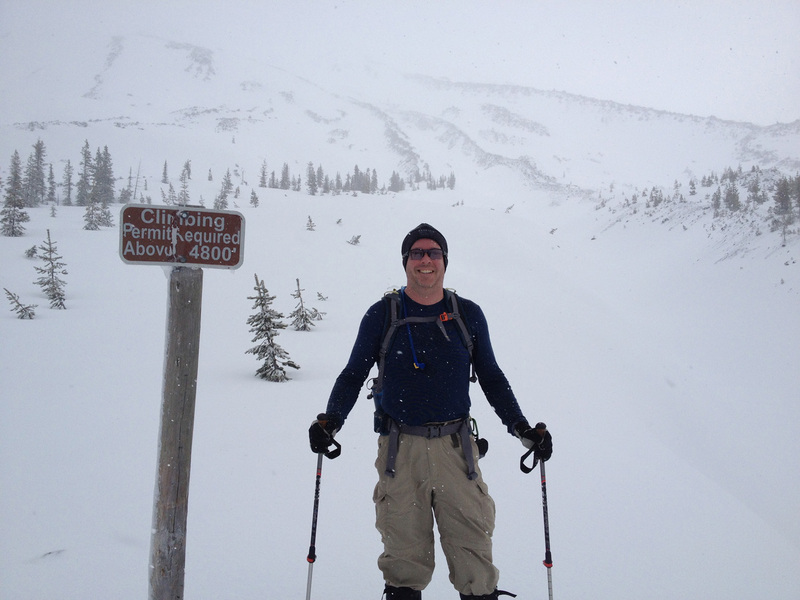 So, it was time to take the snow shoes off for a bit and glissade down the mountain! Everywhere we could find a chute of hard pack we planted our ice axes in and slid down on our asses. It was great fun. Unfortunately there were too many piles of powder so each glissade didn’t last too long. It certainly took us down the mountain faster! We eventually made it out of the steep areas and just kept going down. We threw the snow shoes back on and continued on down the mountain following the same path we took on the ascent. We passed by the 4800′ elevation sign in no time at all and headed back down into the thick forest. 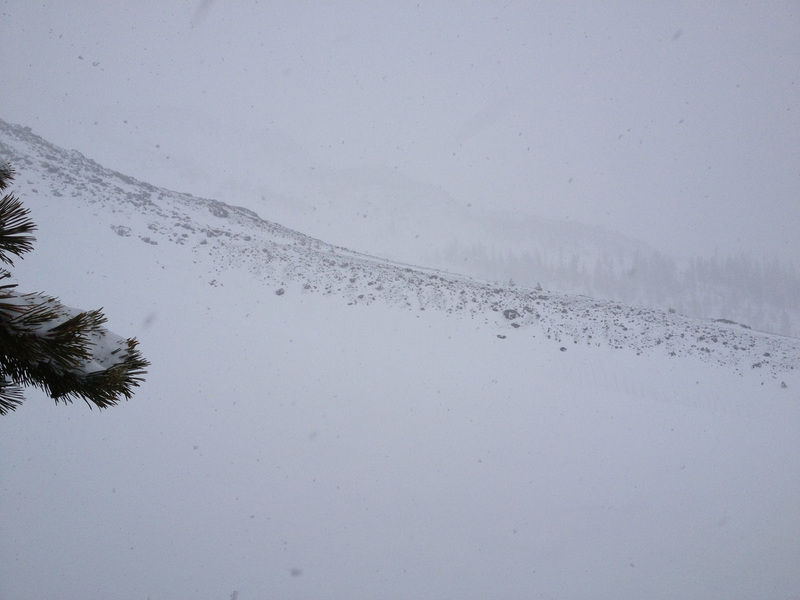 The wind was still whipping around pretty good even here… proof conditions had steadily worsened throughout the day. We returned to the parking lot at 2650′ around 3:15PM and headed to the town of Cougar for a warm meal and a beer. Total hiking distance was about 7.5-8 miles round trip. My path up Mount St. Helens until the weather turned us around. Thanks to Jared for a great day. Mount St. Helens, I may be back for you, don’t you blow your lid again anytime soon!